Thaddeus Young expects to be in the 76ers’ starting lineup, and Spencer Hawes is “hoping to” get clearance to play Friday night against visiting New Orleans. Young, who returned to the team in Wednesday’s loss at Orlando, came off the bench in that game. It was his first appearance in four games, after being away since Nov. 18 for personal reasons. Young hadn’t come off the bench for the Sixers since May 26, 2012, in an Eastern Conference semifinal series against Boston. Hawes has missed two straight with left knee soreness. He said he hasn’t had an MRI on the knee, which he tweaked a week ago against Milwaukee, but said he “felt pretty much normal” while running around at the morning shootaround. 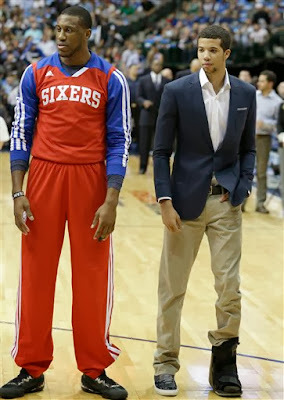 76ers center Spencer Hawes is more likely to return before sixth man Tony Wroten does, Sixers coach Brett Brown said. Both players missed Saturday’s 106-98 loss at Indiana. 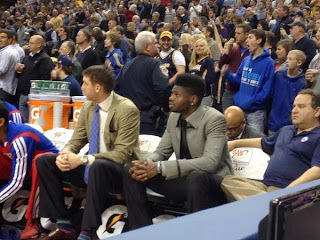 Hawes, pictured, left, was with the team, though he did not dress due to left knee soreness. Wroten, who did not travel, sat out his second straight game with a lower back strain. “I don’t really know,” Brown said. “I think Spencer is probably going to be sooner than Tony. The Sixers (6-9), who had the day off Sunday, next play Wednesday in Orlando against the Magic (4-8). At the start of the week, the 76ers bench featured never-healthy veteran Kwame Brown and one of the league’s worst returns from its collective of reserves. Friday night, a funny thing happened: The Sixers actually got something from its second-stringers. 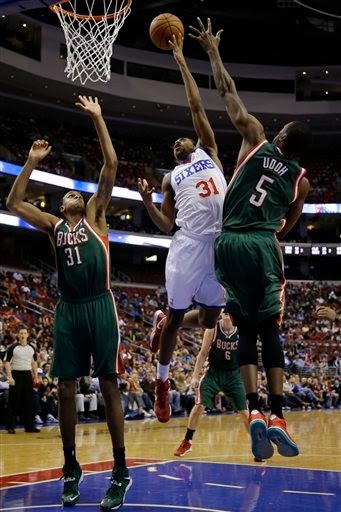 The Sixers’ bench pulled its weight in a 115-107 overtime victory over Milwaukee. The reserves accounted for 35 points on 14-for-25 shooting, to go with 18 rebounds and 12 assists. The group was led by undrafted wing Hollis Thompson, who shot 7-for-9 from the floor for 16 points in 21 minutes. Thompson turned in two of the game’s finer plays: a second-quarter alley-oop dunk, off a pass from Tony Wroten, on which Thompson’s chin was at rim-level, and a 3-pointer in overtime that pushed the game out of the Bucks’ reach. The contributions of the Sixers’ bench players were a far cry from what they’ve averaged coming into their game against Milwaukee. The Sixers’ second unit had been posting fewer than 16 points per game, the fifth-worst average in the league. “Hollis had a big night,” said Evan Turner, who scored eight of the Sixers’ 13 points in overtime. Other players chipping in off the bench were: Lavoy Allen (nine points, eight rebounds, 34 minutes), Elliot Williams (six points, 14 minutes) and Tony Wroten (six assists, 11 minutes). Williams and Lorenzo Brown were signed Wednesday to replace Darius Morris and Kwame Brown, who were waived. Those two guards already appear to be upgrades, as Williams was a player without a contract anywhere and Brown was playing for Springfield (Mass.) in the D-League. 76ers coach Brett Brown said he views rookie Nerlens Noel as a legitimate center, at least at one end of the floor. Brown spoke briefly Thursday about Noel, the 6-11, 228-pound Kentucky product whose return date has yet to be determined. Noel, the sixth overall pick in June’s draft, is still rehabbing a surgically repaired left knee. Noel’s name came up in a discussion about Spencer Hawes and how well the seventh-year forward looked Wednesday at the power forward position. Brown was asked whether Noel would be a player alongside Hawes could thrive, and whether Noel was a legitimate option at center. Brown has said he would consider this season a success for Noel even if the 19-year-old never saw the floor. The first-year coach has said he views Noel’s shooting form as “a total rebuild,” and Brown has invested hours of time into further developing Noel’s game. Routinely, the two work together after practices and in brief workouts prior to games. Thursday, after practice, Noel was tasked with fielding passes of all varieties from Brown with the use of one hand at a time. Wednesday in pregame, Noel was working on his one-handed shooting touch. The Sixers (5-8) host Milwaukee (2-8) Friday. The 76ers waived center Kwame Brown and guard Darius Morris Wednesday, making room for guards Elliot Williams and Lorenzo Brown, for whom the terms of the contracts are unknown. Kwame Brown, pictured, who had yet to play this season while battling a right hamstring strain, is due $3 million. Morris, who averaged 6.9 points in 16.8 minutes in 12 appearances, will make $1.06 million. Williams (6-5, 190), taken 22nd overall by Portland in the 2010 NBA draft, wasn’t affiliated with any team when he got the call to join the Sixers. He had been working out in his hometown of Memphis, after playing with the Cleveland Cavaliers in training camp. He said he knows Memphis guys and new Sixers teammates Thad Young and Arnett Moultrie. Williams played in 24 games with the Trail Blazers in the 2011-12 seaon. Lorenzo Brown (6-5, 186), selected 52nd overall by Minnesota in the 2013 draft, was with the D-League’s Springfield Armor when contacted by the Sixers. He said he spent his Tuesday afternoon driving to Philadelphia, and took a physical Wednesday morning. Brown played his college ball at N.C. State. 76ers rookie Michael Carter-Williams said the bruise on the arch of his left foot has improved and said he’s healthy enough to play Wednesday against visiting Toronto, though he’s awaiting official word on whether he will play. Carter-Williams was a full participant at the Sixers’ morning shootaround at PCOM. He was out of a walking boot and wearing high-top sneakers to get more support for his injured foot, which kept him from the Sixers’ last four games. Carter-Williams said there isn’t one individual person who makes the decision on whether he will play. He said “it’s a combined (decision” and that his only responsibility is to tell Brown and the appropriate people whether he’s physically able to play. The rookie point guard, who is averaging 17.4 points and 7.6 assists through eight games, said his body was “beat up” and that the respite allowed him to recover. He added that sitting next to the Sixers’ assistant coaches during games, a recommendation of Brown’s, allowed him to learn more about the game while it’s going on.